Join us Sat Feb 2nd for annual our Winter Advertising, Coin Op, Toy and Firearms Auction. Featuring many hard to obtain items from a select lifetime collection along with other choice consignments! Payment Instructions: All purchases must be paid in full at conclusion of the auction. Your credit card on file with Proxibid will be charged. If you plan on picking up your purchase at the auction site, please email us at 326auctions@gmail.com or call 260-572-6490 immediately following auction. Otherwise items will be shipped. Shipping and handling will be charged to your card as a separate transaction. Pickup hours are 11am to 4pm daily starting Sunday, Feb 3rd. Please read all terms under Special Terms of Sale before bidding. Thank you! Shipping Instructions: 326 Auctions will ship items unless they deem items need to be handled by Ship & Pack Company due to size, etc. Some items must be picked up locally unless you make pre-arrangements for shipping. Please contact the auction company for general shipping and handling information. 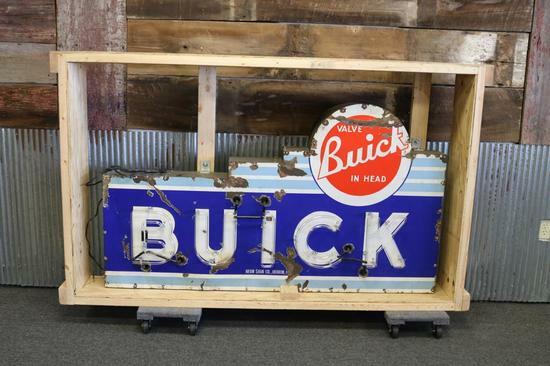 Preview Date & Times: Preview items for auction: Starting Monday, January 28th from 10am-6pm at 326 Auctions, I-69 Exit 326, Auburn, IN 46706 from 10am to 6pm daily. NOTE FIREARMS NOT AVAILABLE FOR VIEWING UNTIL AUCTION DAY, SATURDAY FEB 2ND AT 10AM. TERMS AND CONDITIONS NOTE: We follow all Federal Firearm Laws. 1. All articles are sold "AS IS WHERE IS" and with no warranties or guaranties of any type either expressed or implied made by 326 Auctions Any warranties made by the Seller must be in writing on an instrument separate from the Purchase Invoice and Bill of Sale and signed by both the Buyer and the Seller. In no event shall 326 Auctions, the auctioneer, any employee, agent or associate of 326 Auctions be responsible or liable for such warranties, guarantees or the description of any article offered for sale. 2. All statements printed in 326 Auctions catalogs, ads, brochures, signs and car cards as well as verbal statements made by the auctioneer or staff, have come from the Seller and are accepted as reliable. 326 Auctions assumes no responsibility or liability for representations made by Sellers and shall have no obligation to verify or authenticate such statements or claims. Any announcements made sale day supersede printed information online, in the catalogs, ads, brochures, signs and car cards. 3. Unless the sale of an article is advertised or announced to be otherwise, each lot is offered subject to the reserve price of the Seller. When an article is sold with reserve, the auctioneer may bid on the Seller's behalf in an amount not to exceed the reserve price. 4. Payment of funds due Buyer from any other transaction may, at 326 Auctions' discretion, be withheld from Buyer and applied to other purchases made by Buyer. All payments must be made with good funds, which are defined as credit card, cash, cashier's checks, traveler's checks or personal/company check. Drafts are not acceptable. No article can be removed from the premises before making settlement. All cash payments will be reported to the Federal Government subject to applicable law. 5. If any of the terms of sale contained herein, or in any instrument collateral hereto, are not complied with by the Buyer, in addition to other remedies available by law to 326 Auctions and/or the Seller (including the right to hold the Buyer liable for the bid price), 326 Auctions and/or Seller at its option may do either of the following: (1) Cancel the sale and retain as liquidated damages all payments made by the Buyer, or (2) resell the article on 5 days written notice to the Buyer at a private or public sale for the account of and at the risk of the Buyer, and in such event the Buyer shall be liable for any deficiency plus all costs for such reselling, including moving and storage and the entry fees and commissions for both the first and second sale and all reasonable attorney fees and court cost incurred. All court cases will be heard and decided in DeKalb Superior Court in Auburn Indiana. 6. If Buyer sues 326 Auctions and does not prevail, Buyer will reimburse 326 Auctions for all reasonable legal fees and expenses connected with such suit. 7. Buyer shall pay all city and state sales, use and other taxes assessed, due to or resulting from Buyer's failure to qualify as exempt from such taxes. Buyer also agrees to pay the Buyer's Premium and other any applicable fees. 8. The Buyer agrees to pay a Buyer's Premium of 22% on all online. Buyer premium is added to the hammer price to determine the final bid price. Sales tax is calculated on the final bid price. 9. All payments must be made in negotiable funds. Acceptable forms of payment are cash, cashiers check / money order, bank wire, credit card or personal or business check. 326 Auctions reserves the right to hold all items paid for by personal or business check without an irrevocable bank letter of guarantee. 10. All items listed for sale in this auction have been examined by competent professionals. All thread and insignia have been submitted to UV light and do not glow. Descriptions and pictures have been provided for your examination. It is our policy to sell authentic merchandise and items are routinely refused admittance to the auction; with this in mind, all items are open to personal inspection with prior appointment. All items are sold in "as is, where is" condition with no guarantee or warranty of any kind. Please request additional information or pictures if uncertain on any item. Requests should be made 48 hours before close of auction and prior to bidding. Bid retractions are not allowed and all sales are final. 11. Description Accuracy/Historical References: All descriptions are merely a guide. Descriptions are general observations of what we observe. Descriptions in no way create a warranty or guarantee of any kind. Descriptions often contain historical references. These references in no way guarantee a time frame in which an article was manufactured or a country of origin. Historical references contained in descriptions are not guaranteed or warrantied in any way, neither expressed or implied. They are generalizations of observations made by 326 Auctions staff. 12. Credit Card Charge Backs: By participating in our auction, all bidders agree they are buying under their own inspection, free of duress and are responsible for their purchases. Bidders agree that charge backs of any kind are not allowed and all sales are final. Important Note: Please call or email us with any questions regarding items for sale PRIOR to placing a bid. The time to ask questions about the item is before placing a bid and not after placing the bid or after the auction has ended. 326 Auctions assumes, and the buyer agrees, that by placing a bid, they have contacted 326 Auctions to clear up any concerns or questions they may have about the items for sale. Note: If you are paying cash or check at pickup on Sunday, Feb 3rd or you are paying by overnight check on Monday, you must email us upon end of your bidding as we will b...moree charging your credit card on file with Proxibid at the conclusion of auction Saturday. Thank you! Single sided cardboard has been professionally framed. Shows some areas of wear but nothing offensive. Measures 14.5" x 26.5" . Rated 8.0. Single sided cardboard. Has been framed with a plastic cover. Measures 16" x 24.5". Rated at 8.75. Single sided cardboard. Has been framed. Measures 16" x 24.5". Rated 8.5. Reverse on glass has been nicely framed. Measures 14" x 18". Rated at 8.75. Vacuform single sided sign. Marked Drewrys Beer NO 145. Measures 13.5" x 15". Single sided wood. Exhibits a pair of mallards in flight. Has some surface wear. Measures 10" x 16.5". Rated at 7.5. Single sided wood. Has good color, shows some wear throughout. Measures 10.5" x 16.5". Rared 7.5. SST has good color and shine. Shows wear throughout. Has a few minor bends. Marked Corn States Des Moines. Measures 10" x 28". SST has good color and decent shine. Shows some wear to the field and has a minor bend to the upper corner. Measures 20" x 20", Rated at 7.25. SST has good color and shine. Measures 9.5" x 14". Rated 7.75. SST has good color and shine. Marked SCIOTO Sign Kenton O - Chicago. Measures 9.5" x 13.5". Rated 8.25. DSP has good color and gloss. Exhibits some minor wear aroung the edges and mounting holes. Meausres 20" x 20". Rated at 8.5. SST has good color and shine. Marked Stout Sign Co St. Louis. Exhibits some minor paint loss to the upper field. Measures 17.5" x 19.5". Rated 7.5. Two tin signs in original sidewalk frame. Both have fair color and shine. Measures 18" x 20" x 36" tall. Rated at 7.0 and 7.25. SST has fair color and shine. Measures 4" x 24". Rated 7.5. SSP has good color and gloss. Shows wear in the Nesbits logo and around the edges. Measures 3.25" x 32". Rated at 7.25. SSP has good color and gloss. Shows some wear around the edges and around the mounting holes. Measures 4.5" x 8.5". Rated 8.0. SST has good color and shine. Could improve with cleaning. Tube is good. Measures 8" x 39". Rated 8.25. SST has good color and fair shine. Measures 7" x 26.5". Tube is good. Rated 8.0. SSP has good color and gloss. Has some nicely done touch up around the mounting holes. Tube is good. Measures 7" x 27". Rated 8.0. SST has good color and shine. Has been framed. Field has fine scratches throughout but nothing offensive. Measures 9" x 17.75". Rated 8.0.